At Hospice of the Red River Valley, we are fortunate to have many dedicated volunteers. We celebrate their contributions to the organization and the many ways they enrich our patients’ lives. Location: Thief River Falls, Minn. 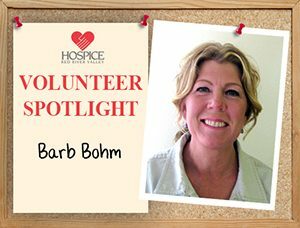 I started volunteering with Hospice along with my daughter in her junior year of high school. We were looking for a service-based activity we could do together. I have so grown to appreciate and admire all the good things Hospice does, and I want to be part of their mission. Going to the lake, fishing and gardening. I have recently been elected to town council and will take my oath in January 2015, so I’m really excited about getting involved in that. I am most proud of my two children, Angie and Reed. They are a true blessing to my husband Kevin and me. Raising children is not an easy task, but there is nothing more fulfilling.